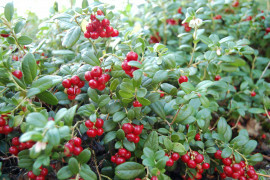 Very productive variety of lingonberry, with vigorous, upright growth. Plants grow 12 to 15 inches (31 to 38 cm) tall, and leaves are dark green. Berries are very large (0.41 gram) and are a bright dark red. The berries grow on the branch tips. The best tasting variety of lingonberries. Ideal for flower beds.